The busiest of the 23 wards in Tokyo's sprawling metropolis, Shinjuku City has countless surprises vying for your attention — many of them hiding in plain sight. It’s almost like a numbers game. From the volume of pedestrians shuttling through the busiest train station in the world or the dizzying heights of the tallest skyscrapers to the multitude of restaurants feeding its hungry inhabitants — and one seemingly random horse trough — here are 10 things you didn’t know about Tokyo’s neon city-within-a-city. According to the Guinness Book of World Records, Shinjuku station is officially the busiest train station in the world, where every day 3.4 million passengers utilize six different train companies operating across 12 different lines. All those people need a way in and out, which is why there are 200 entry and exit points to this beehive of a train station! If that weren’t enough, the number of passengers balloons to 5.2 million when you add the four other main train stations of Shinjuku City (known as Shinjuku-ku in Japanese): Takadanobaba, Yotsuya, Iidabashi and Ichigaya. So, if Shinjuku is the world’s busiest station, where are the “Top 3” located you ask? It just so happens they’re all within a short commute from Shinjuku — and on the very same Yamanote train line! You can find No. 2 just four stops north at Ikebukuro station. If you keep riding the loop for another 12 stops (or about 20 minutes) you will end up at No. 3, Tokyo station. 2. What, where, why and how much? If you’re looking for something new to see, there is only one place to go: the first Shinjuku Tourist Information Center. It’s a one-stop shop to help you plan your activities and itinerary when visiting. The center is cleverly located under the main street that traverses the east and west sides of Shinjuku station, just down the stairs and outside the JR South East Exit. Here you’ll find everything you need to get your trip sorted. Guidebooks and brochures for popular destinations, foreign currency exchange ATMs, and lockers to store all the stuff you won’t need during the day. Going skiing? Get the bus from Shinjuku. Going shopping at the outlet mall? Get the bus from Shinjuku. Climbing Mt. Fuji? Get the bus from Shinjuku. In fact, you can get to nearly anywhere in Japan on a bus from Shinjuku. At the consolidated Shinjuku Expressway Bus Terminal you’ll find over 1,600 long distance buses coming and going from 39 of Japan’s 47 prefectures. Can that many people really be riding the buses? The answer is a resounding yes! Nearly 40,000 travelers use them every day on the nearly 120 bus companies serving this ultra-modern new terminal — known as Basuta Shinjuku in Japanese. And it’s about to celebrate its first anniversary in April 2017. Also, from the very same terminal, you can catch the local area WE bus which will whisk you off to Shinjuku Gyoen for just ¥100 — or just transport you hassle free between the station’s west and east exits. All of the city-operated buses working out of the station have free Wi-Fi services, so you can get on the internet even when you’re on the buses! With so many people passing through Shinjuku each day, they’re bound to get hungry. To help them, Shinjuku boasts the largest number of eating establishments in all 23 wards of Tokyo: 5, 795[. And, if gourmet dining is your thing, not to worry — Shinjuku lays claim to 18 Michelin-starred restaurants. Shinjuku Nakajima is often referred to as the cheapest Michelin-starred restaurant in the world. If you time it right, you won’t have to wait too long in the queue, which usually winds its way upstairs from the basement and out to the street. Once there, you can enjoy a full set lunch for only ¥800. That’s not a typo: you really can have lunch in a Michelin star restaurant for only USD $10! Many visitors to Tokyo also don’t realize that Shinjuku City stretches all the way to Iidabashi, where you’ll find the trendy — and very Japanese — Kagurazaka neighborhood. At Lugdunum Bouchon Lyonnais, for as little as ¥1,850, you can enjoy a three-course French lunch in a true bouchon (relaxed eatery). Just west of the station many of Tokyo’s tallest buildings rise skyward. In the “skyscraper district,” visitors can see over two dozen of the city’s highest structures, including the twin towers of the Metropolitan Government Office — its 45th floor (202-meters high) observation decks are open to the public for free — including several premier hotels like the Hilton, Hyatt Regency, Keio Plaza and Park Hyatt (seen in Lost in Translation). For those who prefer to keep their feet on the ground, the Shinjuku NS building has the world’s largest pendulum clock at its base. The special design of the timepiece gives it just a single hand that makes one full rotation in 24 hours. 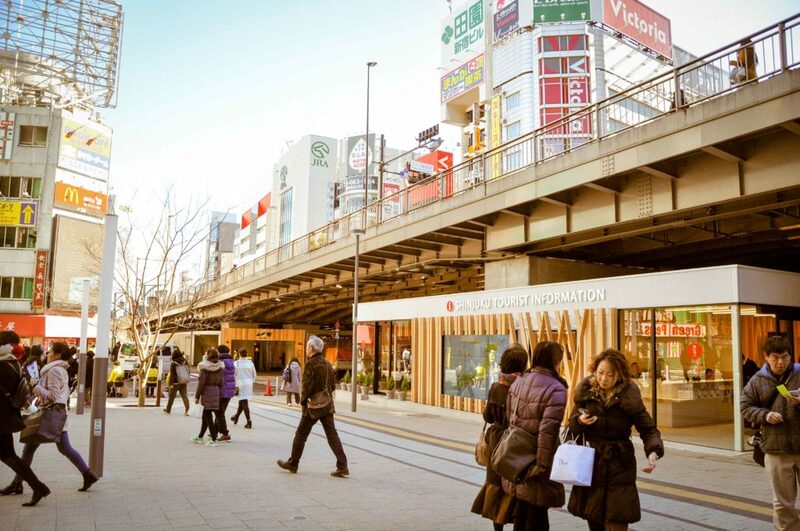 Nearly 5 million people passing through Shinjuku and enjoying a meal are bound to do a little shopping, don’t you think? In fact, over the course of a single year, Shinjuku businesses conduct over ¥1.1 trillion in purchases[ — or just over US $10 billion. That’s almost $28 million per day… every day! One of the biggest challenges you’ll find in the Shinjuku station area is where the station ends and the rest of the city begins. 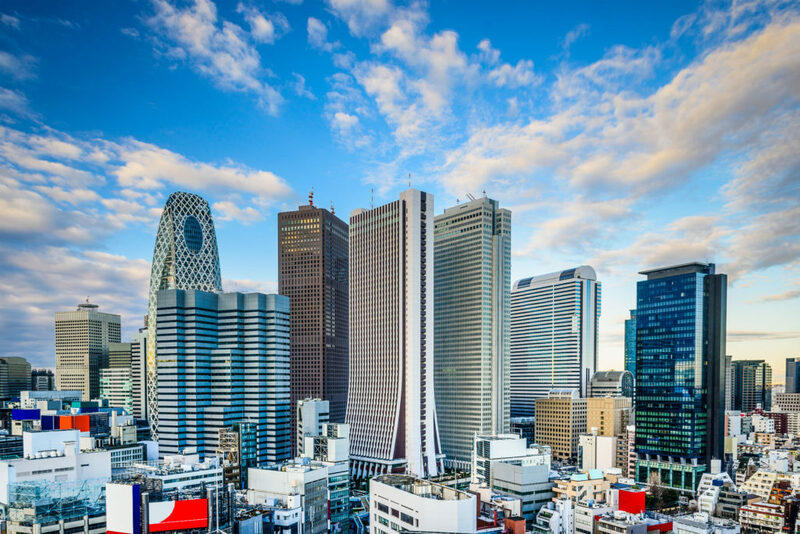 Not to worry though, you’ll find it incredibly convenient as you make your way around the interconnected shopping areas of Metro Promenade and Subnade, which connect Shinjuku and Shinjuku Sanchome stations. You’ll find a seemingly endless array of boutiques and larger outlets like Bic Camera all with easy access from underground for those days when the weather isn’t so cooperative. Shinjuku is the most international part of Tokyo, with more than 10 percent of its 328,000 residents hailing from outside Japan. Nearly 35,000 of Shinjuku’s non-Japanese population come from 10 countries, led by China, Korea and Vietnam as the top three. An incredible change when you consider that in 1980, Shinjuku only had about 5,000 non-Japanese residents in total! 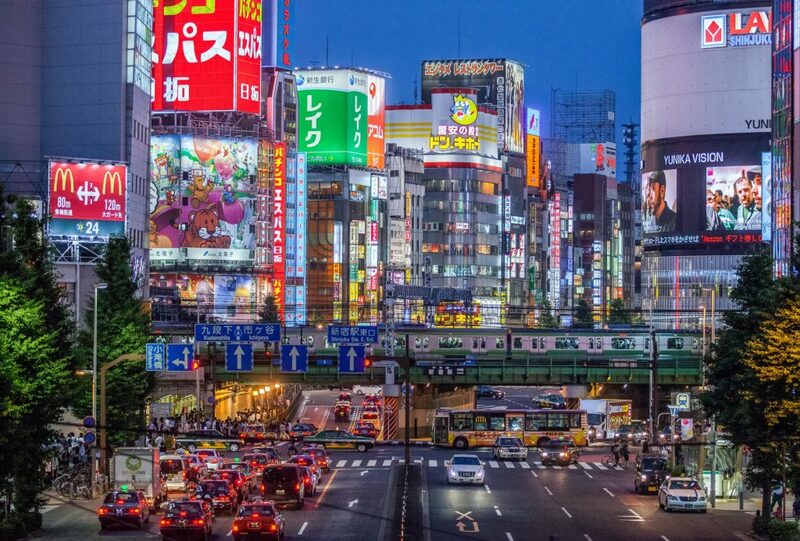 Today, you’ll find five times that number: nearly 25,000 inhabitants of Shinjuku City hail from China and Korea. Shinjuku also lays claim to the largest number of French and Nepali residents in all of Japan. If you compare the area to the rest of Tokyo Prefecture, Shinjuku has nearly three times the population density, at 18,000 residents per square kilometer while the whole of Tokyo Prefecture comprises just over 6,000 residents per square kilometer. © ™ Toho Co. Ltd.
Japan loves Godzilla — and Shinjuku is no exception. In fact, the Hotel Gracery has the one and only official Godzilla head statue in the country on top of its building. 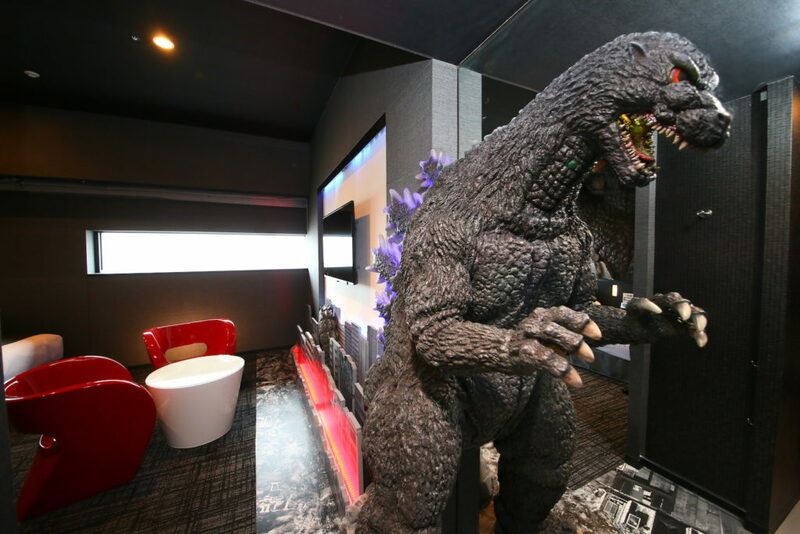 It even offers two different styles of specialty rooms featuring the celebrated kaiju (monster): the Godzilla View Room that has a window on the same level as the life-sized head and the Godzilla Room that takes you inside Godzilla’s world! Previously, the area was famous for the historic Koma Theater that featured concerts by famous Japanese enka (traditional-style ballad) singers. It’s now known as Godzilla Road and if you visit the statue, be prepared for it thunderous roar and rumbling stomps! Godzilla has also been appointed a Shinjuku special tourism ambassador, responsible for spreading the excitement of Shinjuku around the globe. You’ve been warned! The area outside Studio Alta. Horses once drank their fill in front of Shinjuku station. Well, sort of… At the end of the Meiji period, a single marble horse trough (that also had a lower space for cats and dogs with a feeder for humans on the back) was donated by London’s Metropolitan Drinking Fountain and Cattle Trough Association in the early 1900s and installed in front of the original Tokyo government building in the Yurakucho-Tokyo station area. It was relocated several times and suffered damage in the Great Kanto Earthquake. It was finally installed in its current Shinjuku location in 1964. Just beyond this equine watering hole is Shinjuku Alta, an eight-floor shopping complex akin to Shibuya 109 and the area’s de facto meeting point — just look for the big screen TV and huge crowd of people. An insider’s note: from JR station, be sure to take the tunnel to the Lion meeting spot…near the place where you can drink like a horse. With all of the sight and sounds, trains and buses, giant clocks and monster heads, you might need to plan your next move on the internet — or upload that next viral Facebook post. 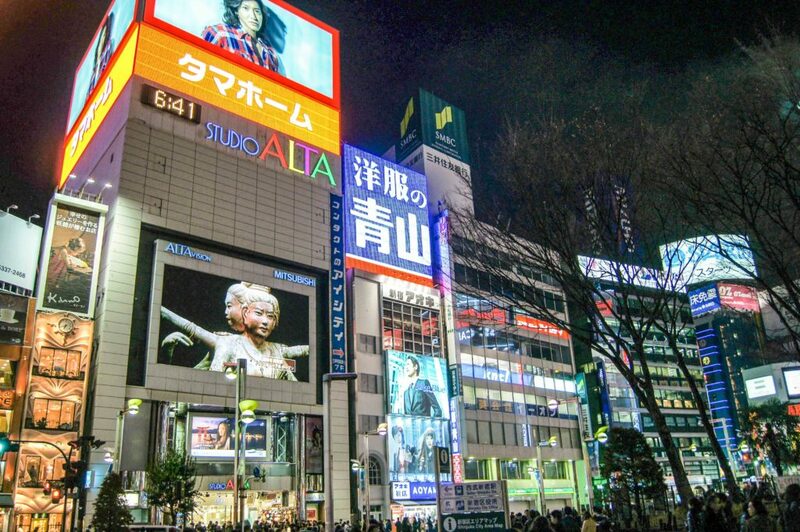 To help visitors, Shinjuku City has set up free Wi-Fi hotspots at over 20 locations across the city. Just look for the Shinjuku Free Wi-Fi sticker to hop online after a quick and easy registration — it’s valid for a whole year! It also supports connections via the NTT Japan Connected Free Wi-Fi app. With that installed on your mobile device, there’s no need for registration. Open your web browser and tap “Connect to the internet” on the help screen. Agree to the security terms. Voila! Connect via Shinjuku City Free Wi-Fi. Don’t let the unique facts and figures of Shinjuku pass you by. Visit the city and explore, then share the amazing number of discoveries with the world instantaneously by using Shinjuku City’s Free Wi-Fi service. 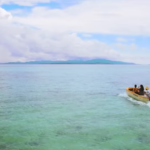 Discover the secret to a long, happy life in this stunning three-part video series promoting travel to Okinawa. As if we needed persuading. 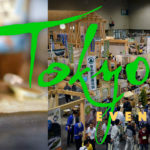 Every Monday we post our picks for upcoming events in Tokyo. 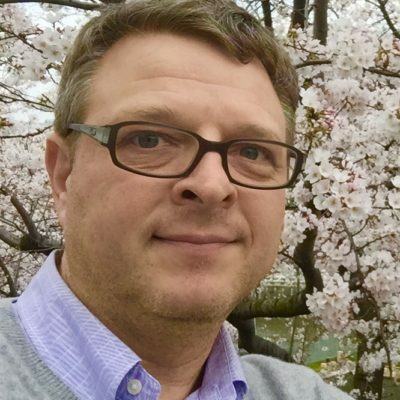 If you would like your event listed here, contact the editor of GaijinPot. 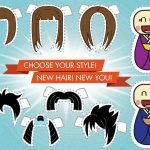 Learning useful Japanese vocabulary is a small price toupee to get the haircut you want.